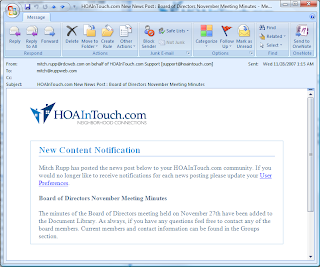 Today I would like to take a few minutes and drill down into the Community News feature of HOAInTouch.com. 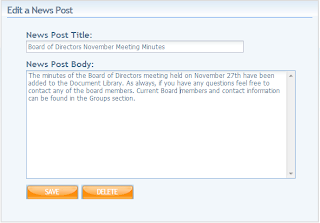 Community News was the first feature we implemented for HOAInTouch.com because the need was so acute. After joining the Board of Directors of my own HOA it quickly became apparent that there was a disconnect between what the Board was focused on and the perception of the neighborhood. To be fair, this really wasn't anyone's fault - it is simply a reality many communities face in today's fast-paced lifestyle. With school, church, social & sporting activities, etc. 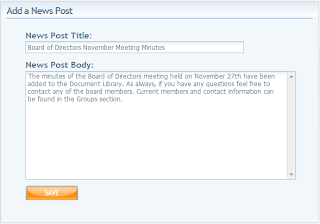 consuming our evenings, who has time to attend monthly Board meetings? For their part, the Board attempted to update the neighborhood via a newsletter mailed quarterly but it just didn't seem to be enough yet it was too expensive to publish any more frequently. So with that in mind we set out to create a system that would be incredibly easy to use and yet powerful enough to keep the neighborhood up to date without users changing their daily behavior. The result is Community News and it is by far the most used feature of HOAInTouch.com. I think this is for two primary reasons. First, the barrier of creating a news post is so incredibly low. As the screenshot to the right shows, a news post consists of just two fields, a subject and a body - much like an email, a concept with which most internet users are already familiar. We knew that our user base would cover the complete spectrum of computer literacy and we needed to ensure that everyone from a computer super-user to my mom (who just got internet access earlier this year) would feel comfortable using HOAInTouch.com. We also wanted to get the Community News feature out there and in front of actual users as quickly as possible. Simplifying by implementing only the barest of essentials helps to expedite the development process and, while there are many different features we could have thrown in, it is anyone’s guess as to what features would actually get used. This way we can get your feedback and focus on adding the features that will provide the most benefit for our users. So let us know if we are missing something you think will be useful! In the interest of keeping the barrier as low as possible, we also made the decision to allow any approved users to post news. At first this tends to make some people a tad apprehensive but the reality is this is a neighborhood community and each person should have an equal opportunity to share with the community. We have found opening up in this fashion really allows for greater community participation and a better informed neighborhood. After all, Community News is only useful if it is used! Also, in the rare event of abuse, the news post can always be edited or deleted by a moderator and in extreme cases the community administrator can disable the user's account. This safety measure ensures that a community's content is accurate and appropriate. Included to the right are a couple of screen shots demonstrating this. The second reason Community News is so frequently used is because it keeps everyone one informed without changing their behavior. When news is posted to the site, each user in the community is notified via email. This allows the entire community to stay up to date simply by checking their email – something they are already doing every day! I don’t believe the power of this simplicity can be overstated. Users don’t need to remember yet another user name and password or remember to check the website daily just to stay informed. They simply continue to do what they already do! We have also made the ability for users to comment on news posts really, really simple but I will save that for a separate post. Hopefully this post has provided a good overview on the functionality of the Community News feature of HOAInTouch.com and provided some insight to the design decisions we made when developing Community News.